I recently learned that some college chick-a-dees have been reading Jenny, looking for some easy, not terribly expensive dinner options to put together during the week. In their honor, I would like to recommend a simple little option that will leave the kids with plenty of George Washingtons reserved for textbooks and happy hour. 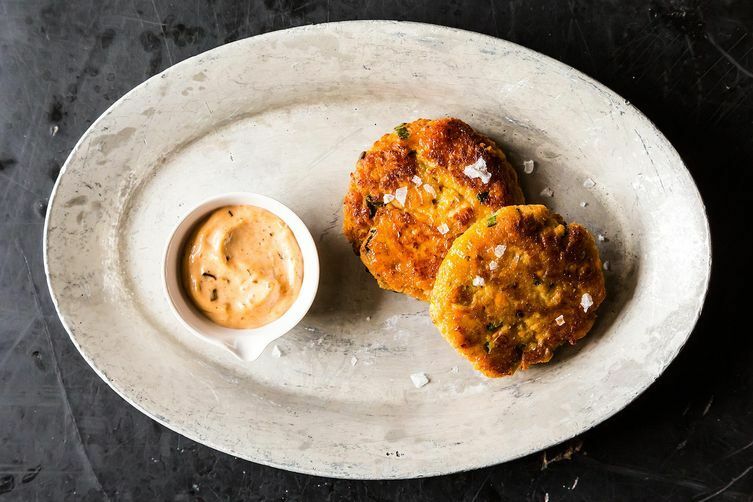 To make Sweet Potato Salmon Cakes with Chipotle Mayo, one must acquire some canned salmon. I confess this left me, that lady who travels great distances to get the fresh stuff from Vern the fish man even though he takes FOREVER to wait on the four of us that stand there in the cold outside his truck wishing that he has not run out of cod loin, a little dubious. Who knew there were so many kinds, for one thing, and would it not be something better left out for the cat? Actually I dislike cats, and probably wouldn’t leave them much of anything, especially my new can of Sockeye. So first you have to boil up a sweet potato – full of vitamins ladies – and please make sure it is nice and soft. Then you are tossing this together with your salmon, some eggs and bread crumbs (I prefer Panko) and some green onions. You may be reasonably worried at this point about the mix, but hold on! Once you’ve got it in your pan of oil (I prefer grape seed for this task) you will start to see that you have something resembling a crab cake, all crispy and brown and good. Without the sauce, my family found it a little bland, so I advise you to make the accompanying mayo, or at least have some hot sauce on hand. Dinner for all of you for under $10! Hopefully someone thought to make brownies. Now please pull that shirt down. Made this with leftover salmon that I was unable to finish at dinner last night, and half a leftover sweet potato I had at lunch. So unexpectedly yummy! And since I'm not doing grains at the moment, I threw some whole raw almond in the blender and ground them up to use in place of the bread crumbs. I like to add coriander, green chilli and sliced ginger to the mix...delish!! Thank you for sharing this lovely recipe! For added college slum factor, my friends and I like making two ingredient chipotle sauce: sriracha and mayo. Throw back Sunday....had salmon patties when I was a kid. I love this combo of flavors. Love the idea Godzilla had of plopping the cake on top of greens. Splendid quick dinner. Thanks! These were great! I roasted some brussels sprouts and had them on the side for a healthy, cheap dinner. Thanks for sharing this recipe! I believe cats can get a bad rap. How much is a can of Sockeye? I may try these tonight. I'm wondering if I could use matzah meal, instead of panko, during Passover? These sound delicious! Hi - this is similar to a recipe of Harriet Roth's. Hers doesn't use mayo, I loathe kosher le Pesach mayo! I've been making them for Passover for years using matzo meal. It's a cheap, healthy, delicious portable meal. This is delicious with a few tablespoons of cilantro mixed in and made a nice meal with a green salad. I think good canned salmon is a gift to the busy home cook, especially for recipes like this one. Harold McGee wrote a fascinating piece on store-bought canned food for Lucky Peach. It also ran this week on Slate. oh i need to look that up thanks! I'm trying this! Canned salmon is terrific in salads and baked pasta dishes, too. Who's Vern the fish man? I love Trader Joe's sodium free canned salmon. And I love cats! they have a big selection there don't they. aaah...the pivotal moment with Vernon. To wait or not to wait. And is it my imagination or has his "menu" gotten shorter? interesting. i am not sure! funny. and yum. and i dislike cats too. maybe you just haven't met the right cat. I always grimace when I pass the canned salmon at Costco, veering off for the oil-packed tuna and anchovies. But next week, I'll pause, and consider the salmon. FYI, CheapBeets has a cute blog! and apparently, had a baby very recently. She also has a cat. Many thanks from Food52's resident college chickadee! Nigella Lawson turned me onto canned salmon in her salmon cake recipe made with leftover mashed potatoes. Look forward to trying this version next time. Thanks for digging it up Jenny. I love recipes for simple and cheap dishes! a bit skeptical of the canned salmon though...i think you could still stay under $10 with fresh salmon. Here in Nyc we have a few great fish places in Chi-town with low prices and good quality fish. sure fresh fish is always better but that would remove both the ease and price, which are the central attractions of this particular recipe. i was a skeptic but as with tuna, it turns out not all canned salmon is create equal! I like to make a bed of greens, so that the hot salmon cakes slightly wilt them.